The award for this year’s most awkward movie goes to Rick Alverson’s Entertainment, a film rooted in morose career purgatory. Now, the last time I used the term “career purgatory”, it was when I reviewed Lenny Abrahamson’s delightful Frank. Frank presented the argument that an artist stuck in a creative rut isn’t necessarily the end of the world. Entertainment proposes a sardonic rebuttal with a comedian (played by real-life alternative comic Gregg Turkington) who has accepted a hopeless fate. Alverson has chosen his film to take place in the Mojave desert. Most likely because its the closest interpretation of a living Hell. 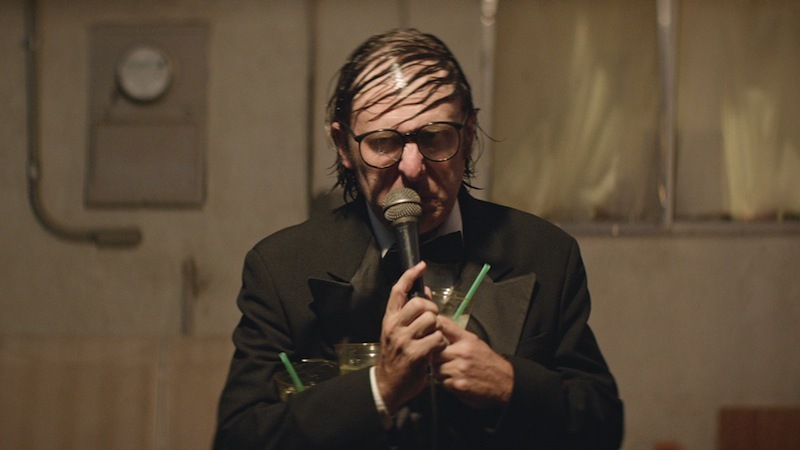 Outside of the film, Turkington’s on-stage persona is Neil Hamburger. Neil is a surly and scathingly rude has-been who uses groaner jokes to take potshots at pop culture icons. The humour exists outside of the vulgarities and is actually funny because the jokes have been juxtaposed in a situation where a pathetic person is jealous of other successors. In Entertainment, Turkington plays a replica of Hamburger – right down to his greasy digs – and plays towards the same abrasive approach. However, off stage, we realize the person playing the disheveled performer holds a deep depression. He’s realized his existence is pointless, and is constantly reminded by his performing partner (a gawky mime played by a dauntless Tye Sheridan) that audience acceptance can be shallowly obtained. Most filmmakers would show the process of a performer slowly losing grasp of his dreams and ending with a sombre message about feeling insignificant. Rick Alverson begins with the end and shows us the gravity of someone hampered by their own emptiness. The kicker is that our lead also realizes he must maintain this career because it’s his only way to integrate himself in the society around him. He may believe his act is meaningless, but he recognizes how essential it is to him. Entertainment is a comedy – believe it or not. Between shows, the comedian meets strangers (including a sketchy dude in a bathroom played by Michael Cera) and he occasionally spends time with his gloating cousin John (played by John C. Reilly). These interactions tend to rely on the off-beat presence of the actors playing these odd roles, but the forced conversations twist us into such tight knots, that we can’t help but blurt out uncomfortable chuckles. It’s important to remember that everything in Entertainment is deliberate. If you’re feeling uneasy or bored or straining through the film’s schadenfreuden yucks, it’s because Rick Alverson wants you to feel those things. Entertainment isn’t a movie where you quote your favourite lines or key scenes afterwards, but you do remember those reactions and emotions the film made you experience.